David Alejandro was 31 when he was diagnosed with retinitis pigmentosa at Massachusetts Eye and Ear in Boston. He is legally blind. He has no peripheral vision. He cannot see at night. He can see straight ahead, but his field of vision is no larger than a quarter, as in the coin. “I spent five years on a couch feeling sorry for myself,” said Alejandro, now 43. But in the summer of 2010, while visiting family in Florida, Alejandro jumped off that sofa. He was angry, mad at the world and mad at himself. In those frantic moments, David Alejandro came back to life. “That said to me that there was nothing that I could not do,” he said. For the past eight years, nothing has stopped Alejandro, and Alejandro has not stopped running. 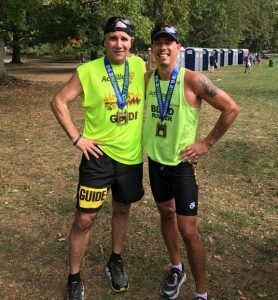 He has run three New York City marathons and three Hartford marathons. On Monday, when they run the 122nd Boston Marathon, Alejandro will be there to run Boston for the first time. Alejandro, a Bridgeport native and Naugatuck resident, runs for himself, runs for salvation, in a way, and runs to prove something. Alejandro’s family was stunned back in 2010 when he said that he planned to run a marathon. “I got inspired, and that flame does not go out,” he said. That spark came, in part, when a family member told him, understandably, that a blind man can’t run a marathon. Alejandro, who lives to inspire, ran that first marathon in 2010. He started at the top, at the New York City Marathon. He did it by himself. No guide runner, 26.2 miles, all alone. Alejandro made a connection that day. While in New York, he was pointed in the direction of a group called Achilles International, a nonprofit organization that helps people with disabilities compete in athletics. With the aid of volunteer guide runners provided by Achilles International, Alejandro runs marathons. He swims, bikes and runs in triathlons, such as the 2015 Pat Griskus Olympic distance triathlon, and even the Gaylord Gauntlet in Wallingford, a 5K race that has obstacles like mud, fire and water. Training for a marathon is as grueling as the race itself. Alejandro runs on a treadmill, one might think. Nope. “You feel like a hamster if you run on a treadmill,” he said. Alejandro gets out on the road every day, and runs from his home in Naugatuck to Lake Quassapaug in Middlebury. He runs on the streets and runs on the Naugatuck Bridal Trail. It equals a half-marathon, he said. And though he can see straight ahead, his vision is poor. “Yes,” he said, in anticipation of the next question. He falls, often. He ran the 2017 Hartford Marathon in 4 hours, 10 minutes. That qualified him for Boston. The Boston Marathon standard for visually impaired runners is 5 hours, but the quota for visually impaired runners is 70. That put the cut-off time this year at 4:30. “I beat that by 20 minutes,” he said proudly. This will be their fourth marathon together. They were a team at Hartford in 2017, when Alejandro qualified for Boston. In a packed field like New York or Boston, every step is its own danger, especially around water stations, where the road is slippery and cups and energy packets litter the course. Alejandro runs for time, of course, he runs for joy and, most importantly, he runs for life. “When I run, I start at one point and try to get to the next point,” he said. That next point is the finish line, where his wife, Tracy, waits. Alejandro is always there, too, at the start line and at the finish.